Densho—Japanese Americans incarcerated during World War II. One Voice at a Time (USC Shoah Foundation Institute). Includes 52,000 interviews with Holocaust survivors; organizers are expanding the archive to include interviews from survivors of the Armenian, Cambodian, and Rwandan genocides. The War Crimes Studies Center at Berkeley has a Virtual Tribunal Project that seeks to make tribunal archives available to a wide range of people as "a powerful educational legacy tool." It includes materials from Sierra Leone, East Timor, Indonesia, Cambodia, and World War II. Our Preservation Week posts so far have included low-tech and high-tech tips (how bookmarks can damage books and backing up your online data), local history (the Museum of History's physical exhibits and digital photo collection), and important Washington legal materials (preserving Washington Territory's session laws). Preservation issues even reach to international law. Destroying a culture's historical documentary record can be a war crime. The Convention for the Protection of Cultural Property in the Event of Armed Conflict (1954) obligates parties to safeguard cultural property, including art, manuscripts, museums, and large libraries, but unfortunately, the existence of the treaty has not stopped destruction and looting in this century's wars. The U.S. is the latest country to ratify the treaty -- in 2009. I hope to learn more when I attend a panel on this topic at this summer's American Association of Law Libraries annual meeting. "From Seattle to the World" is the theme of the UW Human Rights 2011 Symposium taking place on Monday, May 2, 2011. The keynote address, delivered by Larry Cox, Executive Director of Amnesty International USA, will begin at 6 p.m. in Kane Hall 220. A reception will be held following the keynote and symposium from 7:30 - 9:00 p.m. in the Walker Ames Room. 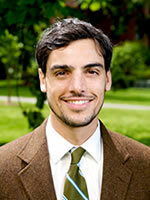 For a list of other symposium speakers, see UW Center for Human Rights. The UW's Center for the Study of the Pacific Northwest and the Harry Bridges Center for Labor Studies present Race, Radicalism, and Repression on the Pacific Coast and Beyond May 12 (evening) - May 14, 2011. The UW School of Law is one of the sponsors. Interested in learning more about Seattle's rich history? 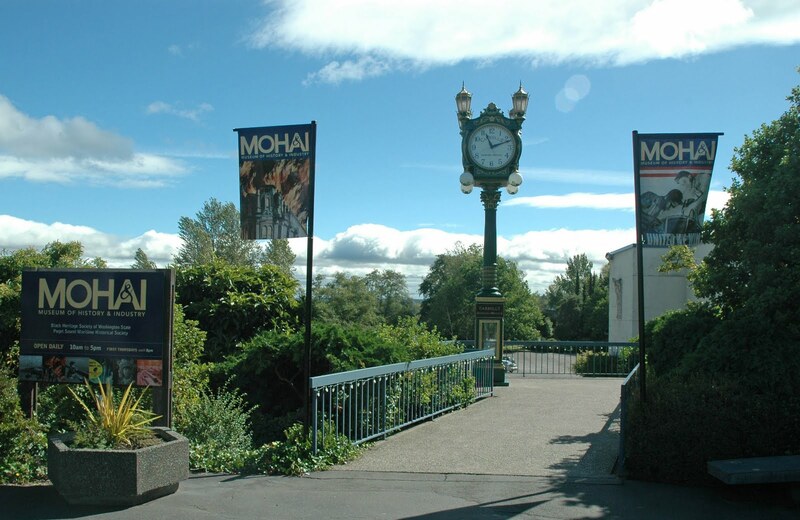 In celebration of Preservation Week, consider visiting the Museum of History & Industry (MOHAI), which preserves and shares the history of the Pacific Northwest. With nearly four million historic artifacts, archives, and photographs, MOHAI presents an amazing history of our area, with exhibits such as Essential Seattle: A City Revealed, The Future Imagined, which chronicles 150 years of Seattle. Consider browsing MOHAI's extensive Photo Archive collection as well. Within this digital archive, you will find a number of images you perhaps have not seen before, such as the Federal Courthouse under construction in 1939 and fascinating images of the Space Needle during its construction in 1961. There is even a portrait of Dean John T. Condon, the University of Washington School of Law's first dean. 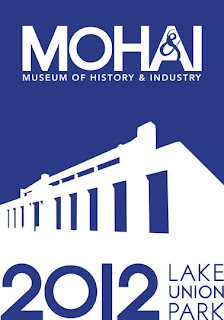 In 2012, MOHAI is moving to the historic Naval Reserve Armory Building in Lake Union Park. 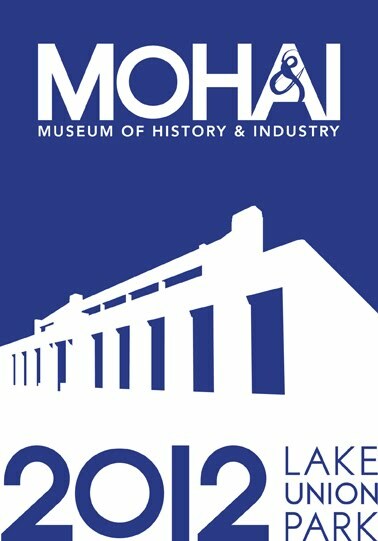 You can still visit MOHAI in its current location on the Lake Washington Bicycle Loop, south of Husky Stadium (just off SR 520 and south of Montlake Bridge). Directions and hours can be found here. We all need to mark places in books sometimes. And legal researchers need to do it a lot. When you're reading a novel, you just want to know where you left off last night (or if it's a multi-generational epic, where you left off last night AND where the family tree is). But when you're doing legal research, you might be referring to several sections of a book at once—rules, statutes, commentary, and so on. For Preservation Week, we're highlighting some ways to mark places and pointing out their impact on books. The least impact method is simply to note page numbers on a separate sheet, leaving nothing in the book. The drawback is that you have to flip back and forth between your notes and the book. Paper bookmarks are useful in the short term. Sticky notes (including Post-it® notes) also should not be left in books because the glue can damage the paper. And once you remove the note, a little glue remains behind and attracts dirt. If you leave a sticky note on a page for a long time, you'll find that it often tears the page when you pull it off. Sticky notes' glue can damage paper. Pulling off the note can tear pages. ﻿﻿﻿﻿﻿Metal bookmarks, sometimes given away as promotional items, look nice, but their sharp edges can dent and tear pages. Metal flags can damage pages. Metal bookmarks can damage pages (and bindings, too). Paperclips are handy, but they damage and tear pages. Have you ever come across a rusted paperclip in a book? Sometimes people grab whatever is around to mark a spot. When it's thick, like a pen or pencil, it can really mess up the book's binding. Pencils and pens are NOT gentle bookmarks! Preservation is not a set of rigid rules that apply in all circumstances. We all need to make judgments balancing cost and convenience with the importance of preserving an object. You might be a lot more careful with a book you inherited from your great-grandmother than you would with a paperback you plan to read once and then give away. The statutory supplement for your tax class will be out of date in a year, so use all the tabs and paperclips and highlighting you want. But the library plans to hang onto its books for the use of future researchers, so please don't fill them up with paperclips, sticky notes and other damaging bookmarks. Use scratch paper to mark pages, and then remove it when you're through. Thanks! Ann Nez shared bookmarks and preservation expertise for this post. A lot, actually. Think of microforms as the original eReaders— an innovative way to pack a large amount of information into a small physical format, accessible almost everywhere. A microform is a microphotographic reproduction of a document. You’re probably more familiar with the terms used to describe their more frequently used forms, microfilm and microfiche. Microfilm is a film strip of microphotographic images. They come in two sizes, 16mm and 35mm. 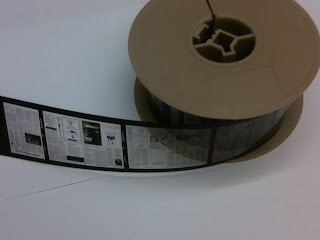 35mm film is usually used for larger documents, such as newspapers. Microfiche is a plastic card with strips of microformed images, usually in the 16 mm size. According to Heritage Microfilm, Microforms have been around since 1839, though they were considered a novelty until the early 1920s, when they were used to create permanent copies of bank records. During the Franco-Prussian war, carrier pigeons were used to carry microfilmed messages across enemy lines). During WWII, microfilm was used to create V-Mail. Letters going overseas were censored and microfilmed and a hard copy was printed out on paper when the film arrived at its destination. Microfilm was also used extensively during the post-war period, as nations sought a way to record paper documents as a way of backing up their heritage and archival collections. Microforms continue to be an important part of library collections because of their inherent stability. Microforms are an analog technology— the only things required to read a microform are light and magnification. Unlike digital technologies, which have the potential to become inaccessible as the technology becomes outdated, information recorded on microforms will always be accessible. Microforms allow valuable information to be preserved when their original format is unable to to be preserved, or maintaining the information in its original format would be impractical, such as newspapers. Perhaps more importantly, microfilmed records and documents are admissible as evidence in most courts. 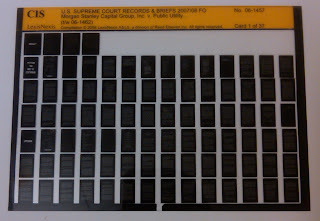 After some early resistance, courts long ago began accepting microform copies as documentary evidence – a status that many electronic records have not yet received, and many states have statutes, providing for the use of microfilmed records as original documents. For further reading on this topic, check out Minnich v. First Nat. Bank of Atlanta, 264 S.E.2d 287 (Ga.App. 1979) (holding that copies from microfilms constitute admissible evidence) or the Gallagher Law Library’s copy of Admissibility in Evidence of Microform Records, located at KF 8947.Z95 N5. Most of us have heard, at one time or another, about the importance of backing up the data on our computer hard drives. But have you ever thought about backing up the data that you create by using Web-based services such as Facebook, Twitter, Flickr, or Gmail? It might be a good idea to start. Gmail, for instance, was recently plagued by a bug that temporarily deleted emails for around 150,000 Gmail users. If you're leery of storing your data online (a.k.a. "in the cloud"), given the recent Amazon outage that caused numerous sites to crash, there are ways to save your online data to your computer hard drive. Gmail Backup, for example, is a free program that you can download and use to store your emails in a folder on your computer. Today is World Intellectual Property Day. The member states of WIPO, the World Intellectual Property Organization, started "World IP Day in 2000 to raise public awareness about the role of IP in daily life, and to celebrate the contribution made by innovators and creators to the development of societies across the globe. World IP Day is celebrated annually on April 26, the date on which the Convention establishing WIPO entered into force in 1970." This year's World Intellectual Property Day, Designing the Future, "celebrates the role of design in the market-place, in society and in shaping the innovations of the future." Visit the World Intellectual Property Day Facebook page to see comments from participants around the world. Speaking of IP, did you know that the law library has several research guides to help you get your bearings in this field? For a general discussion of Intellectual Property Research in an international context, see Jonathan Franklin's ASIL Guide to Electronic Resources for International Law: International Intellectual Property Law. BNA has a number of great resources (UW restricted) for keeping up with and researching IP law. ﻿﻿Most of these are newsletters where you can browse or search recent developments. UW law school users may also subscribe to them via email. The Intellectual Property Law Resource Center is, as the name suggests, a site with lots of different resources. You can search cases, statutes, regulations, secondary materials, and "BNA Insights" (commentary by practitioners). There are even a few short videos! BNA has recently added some of its treatises to its online service. In IP, you can search Robert L. Harmon, Patents and The Federal Circuit (9th ed. 2009) and its 2010 supplement and Harmon on Patents: Black-Letter Law and Commentary. See BNA's Quick Tax Reference App page for installation information. But walking to the shelf and picking up a volume hasn't always been easy. In fact, even as early as 1892, an author wrote that it was nearly impossible to find a complete set. By now, there are even fewer complete sets, and many of those are showing the effects of time. Territorial Session Laws volume with missing cover. The facsimile edition you can now consult so easily–and that will soon be online as well–is the product of years of work by library staff and a publisher. Ann Nez, Coordinator of Technical Services, explains the challenges in this web page. This week is Preservation Week. Watch for more posts about preserving library materials–and your own! The American Library Association (with a number of partners) has named April 24-30 Preservation Week, a time to "highlight what we can do, individually and together, to preserve our personal and shared collections." And so this week, we'll blog about various types of preservation, in the law library and in your homes and laptops. The Bureau of National Affairs (BNA), a commercial database to which the Gallagher Law Library subscribes, is now another source for finding Congressional Research Service (CRS) Reports. Remember to sign in to the proxy server if you're accessing BNA from off-campus. See the Library's CRS research guide to locating CRS Reports via other sources. An upcoming CLE, "The Japanese Legal Profession after the 2008 Financial Crisis and the 2011 Tohoku Earthquake Symposium," will be held on Monday, May 9, 2011 from 9:30 - 11:30 a.m. in downtown Seattle. A distinguished group of legal practitioners from the leading Japanese and foreign law firms in Tokyo will engage in a panel discussion to examine the current state of the legal profession in Japan following the 2008 financial crisis and the 2011 Tohoku earthquake. To register for this free seminar (offering 2.0 CLE credits), see the UW School of Law's Continuing Legal Education site. See the brochure for information about the speakers. Pre-registration by May 3, 2011 is required. Josh Blackman, a blogger and "aspiring academic" has charted the Bluebook's growth from its appearance in 1926 (28 pages) to its 19th edition in 2010 (511 pages). (His chart also links to PDFs of the 1st through 15th editions, which are available on the Bluebook's website. Extreme as this growth appears, it would be even greater if one took into account the increased page size. The 12th edition (1976), which was current when I began law school, was just 6 inches high and slipped easily into a coat pocket. The 13th edition (1981) was 8 3/8 inches high. And the 19th edition (2010) is a smidgen taller, at 8 1/2 inches. The growth isn't all bad. The newer editions are easier to use -- better indexing, more examples, thumb tabs, etc. -- and that 12th edition would never lay flat because of the way it was bound. Blackman suggests that law reviews experiment with having one Bluebook-free issue per year and see how much time it saves. Practical Law Company (PLC) is an online database providing resources for transactional lawyers. PLC is now available--free--to law school faculty, staff and students. Graduates may even continue their access up to six months after graduation. Content for Law Schools is divided into two categories: Corporate & Securities and Finance. Also available is a Summer Associate Survival Guide offering over 50 step-by-step corporate, securities and finance resources designed to help you complete assignments you may be given. You'll need to sign up for your free account to access this material. The Lexis ASPIRE program provides free Lexis access to rising 2Ls and 3Ls who pursue verifiable public interest work. All December 2010 and spring 2011 graduates pursuing public interest work are also eligible. (This includes deferred fall associates and graduates searching for permanent employment who undertake public interest work in the interim.) What Lexis content is available, exactly? Students and graduates must work directly for a non-profit or charitable organization. For more information and a list of exclusions, log in to Lexis for Law Schools and click on the "Career Help" tab. You may also click here. Where Do Your Federal Taxes Go? You are asked to enter your 2010 payments of social security, Medicare, and income taxes. You then click on the "calculate receipt" button to see the breakdown of the total you paid. Even without entering any information, however, you can see at least the percentage distribution of your income taxes. For instance, over 26% of one's income taxes is used in the broad category of national defense. Most of that 26% is spent on military salaries and benefits, operations and equipment, and research and development. Over 24% is spent on health care and over 7% of your income taxes goes to pay interest. In keeping with April being National Poetry Month, the National Archives recently announced the identification of nearly 3,000 writings produced by Walt Whitman while he worked as a federal government employee from 1863-1873. During that decade, Whitman worked in the Army Paymaster's office, the Bureau of Indian Affairs, and the Attorney General's office. According to the National Archives, the identification of these papers "sheds light on the legendary poet's post-war thinking, as well as Whitman's published reflections on the state of the nation that soon followed." You can read more about this discovery in the National Archives press release. IRS.gov's "The Truth About Frivolous Tax Arguments"
One example, "Contention: The IRS must prepare federal tax returns for a person who fails to file" provides the reader with the law as well as supporting case law. In other words, this contention is shown to be false. The information is also available in PDF printable format. Mount Vernon broke ground today (4/14/11) on the new 45,000 square foot Fred W. Smith National Library for the Study of George Washington. Slated to open in 2013, the library will "provide a secure and environmentally-friendly home to Mount Vernon’s vast and growing collection of books, manuscripts, and other archival materials." More information about the project, the collection, the Scholars' Residence and to take a virtual tour, see the Mount Vernon site. Upcoming symposium: Viva La Causa! Viva La Causa! Organizing Farm Workers in the Pacific Northwest During the 60's is an upcoming symposium being held to celebrate the life and work of the late labor leader and civil rights activist César Chávez. A panel of prominent organizers and activists that worked in the state of Washington, who also collaborated and were inspired by Chávez, will discuss Chávez’s enduring influence in our state. For more information about the three-month-long series of events celebrating Chávez's life and work, "Viva La Causa: César Chávez and the Pacific Northwest," see the American Ethnic Studies site. "Communicating the Science of Climate Change" is the topic of an upcoming seminar hosted by the Forum on Science Ethics and Policy. The seminar will be led by Michael McPhaden, affiliate professor in the UW School of Oceanography and president of the American Geophysical Union. He is also a senior scientist at the NOAA Pacific Marine Environmental Laboratory and a Fellow at the UW Joint Institute for the Study of the Atmosphere and Ocean. The Forum on Science Ethics and Policy is a multidisciplinary organization of graduate students and post-doctoral fellows. The forum's goal is to promote "dialogue among scholars, policy experts, and the public about the role of science in society." See the forum's site for more information. "I never use the library: I do all my research online." Some students might think that they never use the library, but these days you can use the library without being in it or touching its books. Every time you sign on to LexisNexis or Westlaw, you're using the library. Although law school subscribers don't pay as much as commercial subscribers–they want students to learn their systems–law schools do still have to pay for these services, and the subscriptions are paid and managed by the library. And of course, you're using the library whenever you use other licensed databases we subscribe to–for instance, LegalTrac, HeinOnline, BNA, RIA Checkpoint, CCH Intelliconnect, ProQuest Congressional (formerly LexisNexis Congressional). Even if you stick to free government websites, you might be using the library to get to those sites. If you aren't, you should consider using the great set of links to Free Law Online that the library maintains–it can save you a lot of time! We're always happy to see you in person in the Reference Office, but remember that you can also send us questions using the "Ask Us!" link on our website. That headline is almost the headline from an article by CNN librarian Kerith Page McFadden in honor of National Library Week. It is chock full of fascinating tidbits about librarians. For instance, both Casanova and Mao Zedong were librarians. That led me to wonder - what is the true core of a librarian - passionate lover or ruthless dictator? According to the article, the American Library Association reports that the nation's public and academic librarians answered almost 5.7 million questions each week in 2010. So, remember that we here in the Gallagher Law Library welcome your questions: stop by the reference office, call at 543-6794, or email us for help. With your help, those statistics could reach 6 million questions per week in 2011! Ah, April! That magical month when the ABA Journal sponsors the Peeps in Law diorama contest. In this third annual contest, the Journal received 40 submissions, which have now been winnowed down to the top eight. Readers (you are included) are asked to vote for their favorite by noon on April 19. The top two diorama artists win $150 and $100, respectively, in Peeps memorabilia from Just Born, the maker of Peeps. If you would like to view all forty dioramas, go to the Peeps Gallery. There you will find such legal depictions as a skydiver's Peepsumption of the risk, Matthew McConaughPeep in the Lincoln Lawyer, a day in the life of a Peeplic Defender, and a case involving zombie Peeps. The Peeps in Law contest typically starts in early March. Contestants submit a photograph of their diorama, including its title and a short (no more than 150 words) description. Refer to this ABA Journal article for information about the 2011 contest. This year the ABA Journal visited the Peeps team during its tour of cities in the Northeast, Midwest, and Mid-Atlantic. The Journal article describes the Peepster, a bright yellow VW topped with a yellow Peep and the crowds that greeted it. For pictures from the tour, visit the Random Acts of Sweetness website. MyApartmentMap is an apartment search engine that allows users to find apartment listings all over the United States. Searchers can view pictures, maps, rental data, find deals, post rentals and contact property owners. MyApartmentMap also has specific search features for college students, pet owners, and military families. You can search (by city and state or zip code) or you can browse (there are lists of states and "popular cities"). If you click on a state link, you are taken to a webpage that groups that state's cities by size. Click on a city link, and you can also limit to specific zipcodes or, depending on the city's size, to specific neighborhoods. Other cities that are close by are linked as well. Apartment lists include a thumbnail picture of each apartment building. Some listings have a link to a 360-degree streetview (however, the address is only "approximate"). A more useful option may be to click on the "map" link. That shows the location of the apartment, and you can add to the map nearby grocery stores, restaurants, schools, and other points of interest. Each apartment listing shows prices for the different sizes of apartments. There is even a tab for that city's "deals and specials." If you just want some general information about prices, rental data is available for states and cities. So, even if you do not find the perfect apartment at MyApartmentMap.com, this website is a good place to start your research! Is law school too prosaic for you? Do you yearn for a daily dose of poetry? Sign up for Poem-a-Day from the Academy of American Poets. Remember: April is National Poetry Month. Nancy B. Rappaport, Decanal Haiku, 37 U. Tol. L. Rev. 131-33 (2005), HeinOnline (UW Restricted)(series of verses on the life of a law school dean). As part of National Library Week (April 10-16), the American Library Association is holding a "twaiku" contest. What's twaiku? It's haiku on Twitter. Share your love of libraries with the world by composing a library themed twaiku for National Library Week! You might win a $50 gift certificate to Amazon. What’s a twaiku, you ask? Simply put, a twaiku is haiku sent via Twitter. Twaiku use the same basic structure of 3 lines with 5-7-5 syllables respectively. Unlike a true haiku, a twaiku can only be 140 characters, or 130 with our #nlwtwaiku tag. The National Library Week twaiku contest kicks off at the beginning of School Library Month (April), and continues through Wednesday of National Library Week (April 13). All submissions must be tagged #nlwtwaiku. The staff of atyourlibrary.org will post a selection of the best twaiku here on atyourlibrary.org, where everyone will have the opportunity to vote for their favorite through the end of National Library Week (Saturday, April 16). The most highly rated twaiku will receive an Amazon gift certificate! National Library Week meets National Poetry Month meets Web 2.0! To celebrate National Library Week (April 10-16), we asked law school faculty and staff to recommend reading—not just law books, and not just books, for that matter. People could—and did—recommend anything from a cartoon blog to a classic law review article by Oliver Wendell Holmes, Jr.
Take a look at the Reading Recommendations: you'll learn a little more about the professors and staff you see every day. And whether you want thought-provoking works related to law, literary fiction, or something light to give you a break from your studies, you'll find something to pique your interest. Two specialized legal dictionaries are now available online on LexisNexis Academic: Dahl's French-English Law Dictionary and Dahl's Spanish-English Law Dictionary. Ballentine's Law Dictionary, 3rd ed. Bieber's Dictionary of Legal Abbreviations, 5th ed. Dahl's Law Dictionary: French to English/English to French is also found in the Reference Area at K52.F7 D34 1995. The Reference Area is also home to Butterworth's Spanish/English Legal Dictionary as well as The ABA Spanish Legal Phrasebook. TrustLaw Connect, launched in July 2010, is a feature of the Thomson Reuters TrustLaw site which helps non-government organizations (NGOs) and social entrepreneurs find free legal assistance. TrustLaw Connect is currently operating in 140 countries. A list of members is available here. Global Entry is a U.S. Customs and Border Patrol (CBP) program that allows pre-approved travelers to speed through arrivals from international destinations by using automated kiosks. Not all U.S. airports have these special kiosks, but the Seattle-Tacoma International Airport does. All travelers using this program must first apply and receive an interview before the CBP will approve them as trusted, low-risk travelers. The program is intended for frequent international travelers, but any U.S. citizen, lawful permanent U.S. resident, Dutch citizen or Mexican national is eligible to apply. Other programs, such as the Fast Low Risk Universal Crossing (FLUX) into the Netherlands, are described here. The ABA Section of International Law has partnered with the Law Library of Congress and Thomson Reuters Foundation’s TrustLaw website to launch a new website called IMPOWR (International Models Project on Women’s Rights). The website will be composed of country pages that cover topics such as: CEDAW status, civic life, healthcare, marriage and family relations, economic and social life, crimes and violence, and access to justice. These topics will be further divided into several subtopics such as current state of the law, law reform efforts and projects, effect of local customs and traditions on implementation and enforcement of law reforms, and the role of local NGOs in obtaining and implementing law reforms. The project is still in the very early stages and the ABA is seeking volunteers to assist with providing links and other information. Volunteers will be able to choose a jurisdiction or possibly a topic over several jurisdictions, so those with foreign languages skills are especially welcome! There are several ways to become involved as a volunteer, such as serving as a contributing editor (conducting research for the database) or content reviewer, writing articles for the IMPOWR virtual journal, or helping with outreach. This would be a great opportunity for law students interested in women's rights and international law to gain research experience and to deepen substantive knowledge of these areas of law while also contributing to a legal research database that will be available for free to the public. To sign up, click here. Hat tip to Mabel Shaw, Assistant International & Foreign Law Librarian at Georgetown, for bringing this announcement to our attention. the percentage of individual tax returns filed electronically (of the 141 million individual income tax returns processed, almost 70 percent were filed electronically). There are over 30 tables that provide such details as a breakdown of the returns filed and refunds issued, numbers and types of taxpayer examinations, collections and criminal investigations, and taxpayer assistance. Attorneys in the Chief Counsel’s Office serve as lawyers for the IRS. They provide guidance to the IRS and to taxpayers on the correct legal interpretation of Federal tax laws, represent the IRS in litigation, and provide all other legal support the IRS needs to carry out its mission. What Happens to Courts If the Federal Government Shuts Down? A news item from the courts indicates that the courts will use non-appropriated funds to continue operations--for 2 weeks. Once that funding is exhausted, however, the federal court system faces serious disruptions. Following their own contingency plans, federal courts would limit operation to essential activities. Essential activities all relate to the resolution of cases. All other personnel would be suspended and payments to jurors would be deferred. Most of these documents have been scanned into PDF images. The handwritten and typed documents are often hard to read. Many documents have been heavily redacted. Still, browsing The Vault for information about people in the Popular Culture category might provide some interesting trivia. Of greater legal interest will be the files under the Supreme Court category, where you can find material about Hugo Black, William Brennan, Fortas, Thurgood Marshall, and the Court generally. The Supreme Court file is large, with 34 parts (each part consists of 100 pages or more). Time will tell if the contents of the FBI's vault prove more interesting than Al Capone's secret vault. Mary R. Rose, Christopher G. Ellison & Shari Seidman Diamond, Preferences for Juries Over Judges Across Racial and Ethnic Groups (2nd Annual Conference on Empirical Legal Studies, 2007), available at http://ssrn.com/abstract=998050. Rafael I. Pardo & Michelle R. Lacey, Undue Hardship in the Bankruptcy Courts: An Empirical Assessment of the Discharge of Educational Debt, 74 U. Cin. L. Rev. 405 (2005), available at http://ssrn.com/abstract=706761. Some of the information in the guide is tailored to Fordham, but you can find the equivalent here. For instance, our library has many of the books cited (although perhaps with different call numbers) and the UW has its own Human Subjects Division for ensuring ethical practices. Update (May 22, 2011): see also this guide from Georgetown's law library.